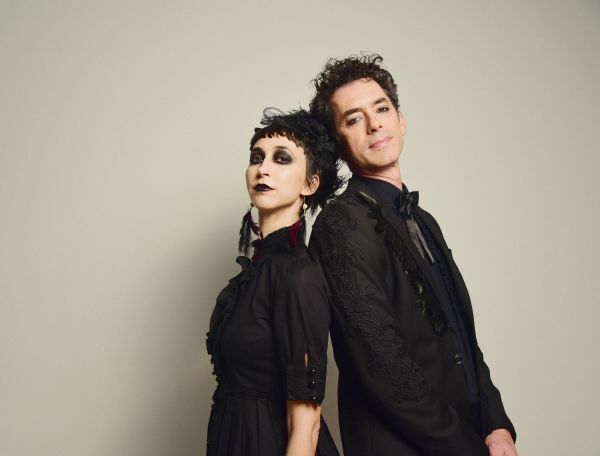 Brooklyn duo Charming Disaster is made up of Ellia Bisker (vocals, uke, piano), and Jeff Morris (vocals, guitar, piano) who just wrapped up a well-received tour of the Northwest to preview their enchanting and disturbing new full length Spells + Rituals, which comes out June 7th. 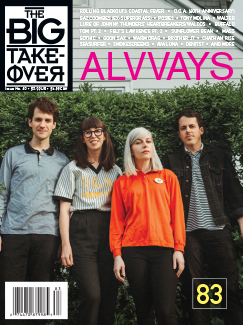 The Big Takeover is really pleased to be hosting the premiere of the video for “Soft Apocalypse”, an Armageddon-time indie popper and album closer. The fun video features the, yes, charming, duo who celebrate the end of the world by running through a bunker’s corridors to hunker down in a disaster shelter. Backed by projected images of doom and destruction (explosions, lightning blasts, fires, and ummm, of course, a Rodan-like creature), the pair perform the song for the camera, brightly intoning the stark to amusing lyrics with a tuneful, sing-song delivery. Soon it’s party time – right before a final big bang that, of course, is caused by humans and not nature. The album Spells + Rituals blends very thoughtful and funny American Gothic imagery with myth-based musical alchemy. As the surf-punk/pop of “Soft Apocalypse” shows, they also hark back to how Midwestern new wavers and New York punk inverted rhythms and made satire music fans could dance to. Spells + Rituals is Charming Disaster’s third album, and each song is like a spell or ritual inspired by folklore and mythology, as well as true crime and books. The pair lists “Edward Gorey, Tim Burton, Raymond Chandler and the murder ballads of the Americana tradition” as influences. Musically, there is a great acoustic punk drive to the whole record which matches the potency of the macabre humor. Without the grinning skull inside the loveliness of the tunes, or the dark campy heart inside the weird tales and odes to misery, it wouldn’t all seem so magically in balance and so engaging. And it certainly is!